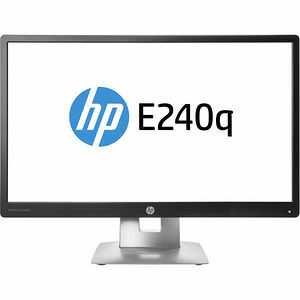 Put more of your work onscreen and work comfortably with the Quad HD resolution and adjustable ergonomic settings of the of the HP E240q 23.8-inch QHD Monitor. Quad HD from across the room. Experience 2560 x 1440 resolution and terrific 3.6 MP color quality for every detail of your work. Easily collaborate with colleagues on the 23.8-inch diagonal IPS screen that delivers 178-degree viewing angles for great views from almost every seat. Create your own comfort zone. Be comfortable and productive with adjustable tilt and swivel settings and an impressive 150 mm height adjustment range. Use pivot rotation to customize portrait or landscape views. Just add your PC and your devices. Enjoy easy connectivity to your PC and everyday devices with HDMI, DisplayPort, VGA, and USB ports.